Props to Proper Burger Co. 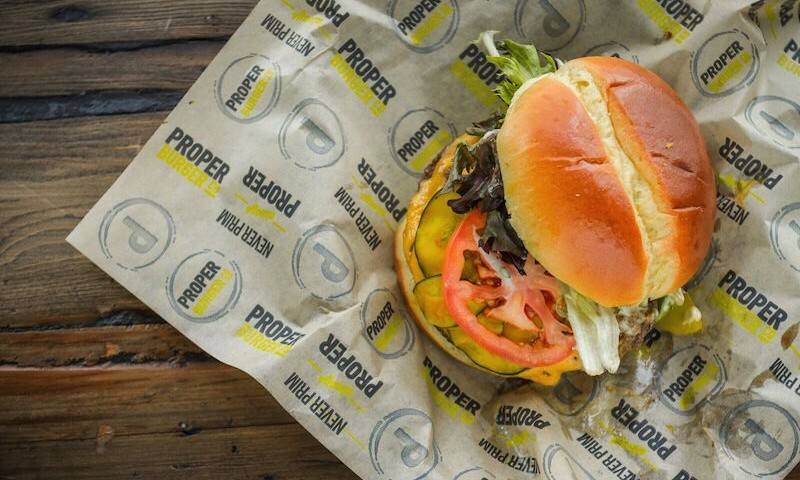 Tags: Proper Brewing Company, Proper Burger Co.
Monday – Sunday: 11 a.m.–10 p.m. When Avenues Proper opened three years ago, diners were charmed by their crave-worthy fare and the beer brewed at their Avenues location. This year, they’ve expanded with Proper Brewing Co. and Proper Burger Co., a casual burger joint serving Proper Beer in downtown Salt Lake City. This welcoming restaurant offers plenty of seating, including a front and back patio. Neatly decorated in gray with lime-green accents, the décor is minimal. Wooden tables add a warm, inviting touch. The natural lighting is pleasant, and the chairs and booths are comfy. I also dig the friendly, casual service. Simply place your order at the counter with a cashier who’s happy to answer questions and provide suggestions. Take a number and find a seat. Drinks come out first, followed quickly by food. 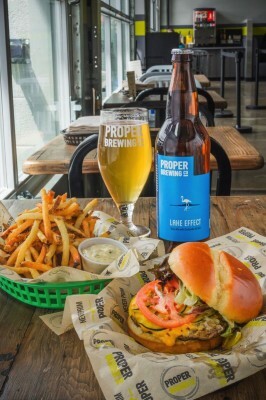 Proper Burger Co. offers the perfect pairing: the well-seasoned Proper Style burger with the tart and refreshing Lake Effect Gose. 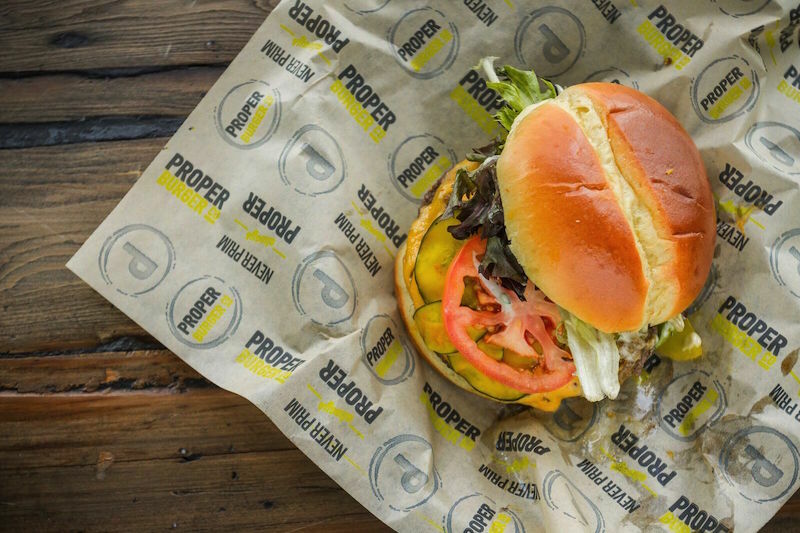 There’s something for everyone at Proper Burger Co. The purists will be happy with the Plain Jane ($4.49), a burger topped with lettuce, tomato and ketchup. Those with more adventurous palates will be overjoyed with the rest of the menu. There’s even a burger called the Truffle Shuffle ($25.99), topped with American sturgeon caviar, truffle aioli, bacon and a fried egg. I was eager to sample the Proper Style ($6.99) burger. I was hooked at the first bite of well-seasoned, savory beef, topped with a superb combination of luscious caramelized onions, housemade zucchini pickles and good ol’ American cheese, which melts evenly and imparts a pleasant, salty flavor. The zucchini pickles are tart and crunchy—the perfect balance to the rich flavors. Fresh romaine lettuce adds an appetizing crunch, and two slices of tomato and Proper Sauce make the burger a little messy—but in a good way. This is everything I lust for when I crave a burger. And yes, I would deem it a “Proper Burger.” The beef patty was on the thinner side—if you’d like a bigger bite, opt for a second patty for $2. Those who don’t like hamburgers can buy an all-beef hot dog, chicken breast or a house-made veggie burger for an extra 99¢. My husband was excited to hear this news. He ordered the Sundance Kid ($7.99), replacing the burger with a sliced beef hot dog. The commendable flavor profile in the Sundance Kid is perfect for the smoky taste of the hot dog. Sweet and tangy housemade BBQ is slathered over the bun topped with crisp, thick bacon, an ample squirt of zesty Cheez Whiz, crumbled Fritos and a single onion ring. After the first few bites, the gobs of Cheez Whiz and the soggy bun were an unpalatable mess. If I were to attempt this burger again, I’d request that they go easy on the toppings. The Hipster ($7.99) is loaded with trendy toppings like kale pesto and red onion jam. The fresh spinach and garlic aioli round out the bright flavors, but the sweet, caramelized red onions and the lemony-fresh herb cheese overpowered the kale pesto. Aside from missing the pesto, I relished each bite. Out of the burgers I tried, The Hipster with the veggie patty won my heart. Made in-house with a black bean base, the veggie burger is a formidable substitute for meat. The patty, with the tempting contrast of a light-and-fluffy inside and a crisp outside, stood up to the toppings and the bun like a champ. The Hand-Cut Fries ($2.99) are my dream fries. Hand-cut into thin strips, they are crispy, served piping hot with a sprinkling of salt minutes after emerging from the deep fryer. The Onion Rings ($2.99) are just as amazing: golden brown with a super crispy outside and perfectly intact onion inside. They’re both served with aioli, a cool creamy garlic sauce that accentuates their flavor and crunch. The prices would be less steep if the fries were served with the burgers. I paid $14 before tipping for a beer and burger without fries. Another time, we spent $25 for two burgers and fries without anything fun to drink. Happily, the drink menu is reasonably priced. Proper Brewing Co. has made a name for themselves in the past few years with intriguing brews. There’s a selection of bottled beers as well as four beers on tap. Buy a pint for $5, a pitcher for $12 or a sample for only 50¢. Be sure to taste the Lake Effect Gose, a German-style ale with coriander and local salt. With a unique flavor profile of lemony tartness, slight floral notes and salt, a gose is one of the most unusual beers you can find. Proper Brewing Co. was the first to introduce this beer in Utah, and it’s had a cult following ever since. The Lake Effect Gose in particular is refreshing and perfect to pair with rich, greasy food. The locally brewed Stinger Hard Cider is on tap, served in a wine glass for $4. There is also a concise cocktail menu (Whiskey Ginger, Bloody Mary, Gin & Tonic or Rum & Coke) priced at a thrifty $6 each—or complement your burger with a glass of red or white wine ($6). A welcome addition to the neighborhood, Proper Burger Co. is ideal for a quick lunch, after-work drinks or even a Sunday burger brunch.